UPDATE (3/12/2014): a-infos radio is back online with its servers in a new home. Contributions are still needed to add disc storage space and replace worn hard drives. Help keep this invaluable service going. Contribute here. This was an email I just received, and the message is clear that the whole a-infos archive at http://www.radio4all.net/ is about to disappear owing to a loss of server space. RADIOLA! is only one of many worthy programs archived on the site. If this is a service you use, please consider helping whatever way you can. This is a nasty and sad email to send out, but I have no choice. Lyn and Shawn, the other founders of radio4all have no time to continue with the project, we're being booted from our free rack space and power arrangement, and I'm out of cash. I am sending this note to the 250 most recent uploaders (that's pretty much everyone who has contributed a program in the last year). If you want the service to continue, we need some organization, some fundraising, and an expert php/SQL programmer to take over from the excellent foundation that Shawn built -- the servers run without problems for months at a time. I am happy to continue maintaining the hardware and doing the network stuff but I can't do it all. I am hoping that among you all there is a group of people who can form a new radio4all organization, if it is of value to you. Radio4all at the moment is throttled at 10 megabits per second in order to keep our bandwidth costs to the level that's matched by monthly contributions. If opened wide, even now it immediately consumes about 5 times that. The hardware and software are quite capable of this rate. The real cost of doing this in a data center here is in the range of $1,200 a month, and we need to rebuild the server boxes which have done more than anyone should expect over the past many years. This is a question of interest and an appeal for help. More than 17 years ago, Lyn Gerry and Shawn Ewald from KPFK had the idea for radio4all (www.radio4all.net) to distribute radio programs from independent producers. They had no way to make it happen from a hosting and server hardware point of view, and I volunteered to do it. We met for an afternoon in Berkeley and figured out how to make it happen. It started with a couple of boxes on a shelf in my workshop in San Jose, now it's serious servers on serious bandwidth at a data center in Santa Clara. I have built the servers from surplus parts and gotten sweetheart deals for bandwidth when I could, and the service is running today with about a hundred programs being uploaded every week and thousands of downloads worldwide. There is about 2 TB of program material in the archive. Lyn quit the effort several years ago, her organizing job was finished and the vision she had of a free, unregulated mechanism for uploading and downloading radio programs remains today. Shawn did a super job writing the software that runs the site, and migrating it from ColdFusion to a more generic open source implementation. Now he's swamped with his work in New York and has no time to maintain the software. Then there is the little problem of money. No one wants to pay for the service; I have contributed about $3,500 of my own money keeping it running, paying for bandwidth and server parts, and wheedling rack space and power at a colocation facility in Santa Clara. There is a trickle of contributions coming in so that amount is not growing, but it will all end soon. Our deal for rack space and power has ended, I have two weeks to get the servers out of the rack. The archive server is down, the main server is running on one disk drive, the other drive in the array has failed. This has cost $150 a month, to replace it will be about $350, and the lower-tier discount data center plans I'm being offered will not be as reliable. To replace what we have with equivalent quality will cost around $1,200 a month, and that does not include the cost of the hardware maintenance that is badly overdue. We have had essentially zero downtime in four or five years. Shawn's suggestion at this point is to migrate the archived programs to archive.org and shut off the radio4all service. There are probably plenty of other ways that people can use now (that weren't available 17 years ago) to get their programs out for stations to broadcast. Absent a different solution that's what will happen. I'm happy to continue keeping the hardware and network running if there is still a need, but I can't do it all. I'm not a fundraiser and I'm not a programmer. Anyone in New York who can talk to Lyn (upstate) or Shawn (Manhattan) to see what they would like to see happen, should do that. They haven't talked to each other in years. This RADIOLA! is drifting over its own boundaries. RADIOLA! streams continuously from my Live365 station. Outside the lines-cast here. Each RADIOLA! program is sent to subscribers on my mailing list (email here). Just over three years ago I went way out on a limb with a theory about the identity of Tempo King. I extrapolated that he was actually a vocalist by the name of John Arcesi (1917-1983), who at that time (1936) had recorded with Louis "King" Garcia. My basis came from the Tempo King and Louis Garcia groups having Joe Marsala in common. 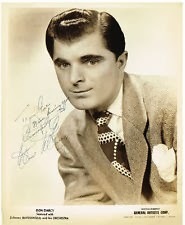 Joe Marsala lived in the same apartment building as Joe Venuti, who employed Arcesi (then working under the name Don Darcy) as his band vocalist. Venuti was also known to enjoy a good practical joke. They are obviously not the same person. 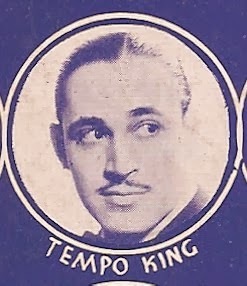 In further scouring my available reference sources, I find a date of death cited for Tempo King of June 25, 1939. I find no further reference to that other than the entry in Roger Kinkle's The Complete Encyclopedia of Popular Music and Jazz 1900-1950. King's putative birth year was 1915, and I saw another reference to "intestinal complications" as the cause of death. None of the above stated may be quite accurate, of course. I sincerely apologize to all those who followed me down this bumpy dead-end lane of speculation, but at least we had some good tunes along the way. This RADIOLA! is a distinct improvement over itself. RADIOLA! streams continuously on my Live365 station. Remarkably adequate-cast here. Each RADIOLA! is sent to subscribers on my mailing list (email here).